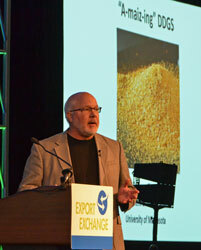 Research continues to show the value of dried distillers grains (DDGS) as a high quality animal feed, and the need to increase global demand for DDGS was a hot topic of discussion at this year’s Export Exchange. Dr. Jerry Shurston, professor at the University of Minnesota and Consultant for the U.S. Grains Council (USGC), gave a presentation during this year’s event on the co-product’s potential in both the domestic and the global animal feed markets. For the last 18 years, Dr. Shurson has focused his research on the ways to increase the value of DDGS, a product that he finds truly amazing. He discussed how production, exports, and the industry’s understanding of the feeding value of DDGS has changed through his years of studying the industry. “One of my messages today is that we’ve got to narrow this gap between what we’ve discovered at Universities and through research and helping those that are buying and using the product to know how to use it to optimize its value,” he said. He also discussed what he called “precision DDGS,” referring to the changes in the technologies that are able to analyze an assess the properties of DDGS that have long been thought of as variable and uncertain. View and download photos from the event here: 2016 Export Exchange Photo Album.